Earlier this year, Samsung, the Korean smartphone giant had emphasized on an innovative design with their flagship Galaxy S8 series that would have the in-display fingerprint scanner embedded under the screen of the device. However, the tricky implementation of the in-display fingerprint scanner forced Samsung to skip it in the S8 line of smartphones. As a result, reports of people speculating the inclusion of new in-display fingerprint reader in the Galaxy S9 and S9+ smartphones started doing the rounds. 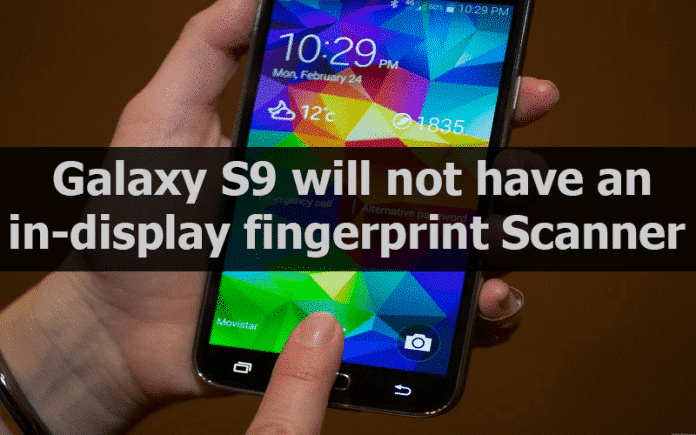 Now, according to South Korean site The Investor, Samsung Electronics has decided not to include fingerprint sensors under the screen of the S9 line of smartphones. We had recently reported how Samsung was finding it difficult to implement the in-display fingerprint scanner in its premium smartphones due to technical complications. Like the previous models, the sensor will be placed on the back of both the Galaxy S9 and the Galaxy S9+ smartphones. However, Samsung will try to accommodate the in-display scanner on the Galaxy Note 9 instead, which is likely to be introduced in August next year, The Investor said. “Samsung won’t get rid of fingerprint sensors in its handsets, as there are many services and platforms run based on the technology,” an industry watcher told The Investor. Apple, one of Samsung’s biggest competitors, has given up on fingerprint scanner entirely in the new iPhone X in favor of its new Face ID. However, Samsung does not follow the same. It is reportedly working on a development project known as “crown” that is looking into installing of the fingerprint sensor under the screen of the Galaxy Note 9.